Tears fall in the moments of sadness but they are not complete. Our minds will wander through memories and a single tear will fall again. It has taken some time but I have created what I needed for myself and what I hope others will find comfort in as well. The Silent Tear jewelry collection is a memorial to those we have lost and honours their memory. Each piece represents the simplest of intentions and is a tribute to a life once shared. The wings of memories pieces send thoughts to those who are no longer with us. We may have let go, but we think of them often. Designed by and for Moosonee Puppy Rescue. this piece was donated by a woman who has a shop on etsy. i purchase beads and pendants from her to create my own pieces but when she researched moosonee puppy rescue she wanted to contribute something of her own. this special piece represents the power of giving and sharing, without a need for praise or recognition. we are grateful. This ethnic Tibetan turquoise tear is the stone of truth, strength and self-expression. When we are strong enough to be honest with ourselves we are able to find inner harmony. The faux leather cord is 20" in length. This ethnic Tibetan red coral piece is a stone of transformation and peace. It prevents us from wallowing in depression and we often need such a reminder. Silver - is the metal of the moon and it increases the strength of the stones it accompanies while bringing calm and balance. The hints of turquoise lend strength to our journey towards peace. The faux leather cord is 20" in length. this carnelian tear provides protection and it heals by balancing our emotions. The darker beads ground us and allow us to be present in the moment. This large amber stone contains the power of the sun yet heals gently and from within. amber relieves stress and anxiety while the small turquoise stones lend strength to the mending process. the single coral stone encourages balance and enhances the beauty of the piece. this tear of Tibetan amber REPRESENTS both the sweetness and the sorrow of finding our own way. standing as one takes strength and courage but the rewards of knowing who we are cannot be MEASURED. Once we BELIEVE in ourselves, we are able to love another again. The glory rests in the individual uniqueness of each relationship we are fortunate ENOUGH to share. carnelian is the stone of individuality and represents the UNIQUENESS of the love we knew. times of laughter, light- heartedness and moments of play outweigh the sadness of loss over time. the nine tears acknowledge those that were shed in sadness. they were cleansing and led the way to happier rememberings. The supporting carnelian beads hold joyful memories and remind us of fonder times. The necklace is 22" in length and, as is fitting, is one of a kind. Jasper is a nurturing, protective stone and this Picture Jasper tear will bring comfort while alleviating fear. It offers the courage needed to struggle through crisis and wisdom enough to disregard negative energy. the yosemite earth pendant represents the simplicity of life when we are able to let go of all we hold tightly and release all we no longer need. contentment stems from pleasures that are free from complication such as a walk with the dog, gazing at the moon or admiring the beauty of the landscape ahead. self begins with your very being then grows into who you become. the roles we play have great import but THERE is no greater worth than that of the individual. self-pride is not a given, it requires honesty, fairness and accomplishment. turquoise is the stone of truth, strength and self-expression so this piece celebrates the person of character you have chosen to be. length is 24”. this ethnic Tibetan TURQUOISE tear is the stone of truth, strength and self expression. Once we are honest with ourselves, we are able to feel at peace. The red coral beads support our commitment to accept, and be in the moment. This carnelian tear provides protection from negative EMOTIONS such as anger or resentment. it balances emotions and supports a sense of peace which allows for a renewed love of life. the tiny turquoise stone promotes hope and combines with the REFLECTIVE powers of silver to create a new-found-appreciation for lives lived and relationships shared. the faux leather cord is 20"
Peach Moonstone is REFLECTIVE and the beauty contained within each gemstone holds the secret of our soul. When we are able to ease our mind with thoughts of acceptance, a personal sense of calm is created for we no longer battle what we cannot change. we no longer react to others but surrender in peace to ourselves instead. worry is replaced with contentment and the secret of abdication from outer conflict is ours to keep. this tear of Tibetan carnelian amber gemstone is the stone of individuality. It promotes creativity and allows us to find our way. Through darkness or doubt this stone gives us the courage to overcome and continue. The carnelian tear promotes trust in your own judgement and stabilizes your emotions. you are then able to banish confusion and self-doubt. the silver beads offer strength in the face of pain or grief and provide you with the courage needed to move forward. rED jASPER is known as a stone of vibrancy and endurance. It possesses a life force that offers stamina, focus and determination. This tear will calm our emotions and create the lasting and stable energy needed to face our fears, struggle through battle and rectify wrongs. this ethiopian pewter tear is coupled with light blue and silver beads to create a gentle look of thoughtfulness. when the intense emotion of loss has passed, this is a gentle reminder of all we once shared. the beads move on the 18" leather cord to reflect how life flows forward if we let it. This detailed tibetan silver and ruby bead holds the mysteries of love that is shared with one who is devoted, THOUGHTFUL and true. such relationships are rare and while they need not be completely understood, they are greatly valued. Mykonos beads are made out of metal, in this case bronze and copper and they combine strength and beauty. The soft blue of the beads and leather cord remind us that even painful memories contain a fondness of times shared. Rose quartz is the stone of unconditional love and the clarity of the tear speaks to the pureness of devotion. a gentle kindness is found in the soft hue of the stone while the raw silver beads lend strength to the simplicity of this dog’s love. the soft shades of grey and ivory beads mirror gentle tears of happiness. when a simple gesture touches our heart and causes us to appreciate the love we share, or a moment of realization reminds us of all we are grateful for, tears of joy may fall. Amazonite is the stone of courage and it holds the purest of intentions to love and be faithful to another. never to look away or be careless with feelings. there is no greater belief than the one we hold in a relationship that never let us down. Silver chain is 26” in length. Mykonos beads are made out of metal, in this case bronze and copper, and they connect us to the earth below are feet. They are grounding when our emotions threaten to overwhelm and take flight. The beauty of the beads reminds us that sadness can, in time, become the fondest of memories. These are the sweetest tears of all as they contain memories of delight. the beauty of the chrystal teardrop offers a sense of pure joy while the soft hues of the strawberry quartz beads remind us of a kindness shared. Necklace length is 28”. after a loss, black tears are the first to fall. they come with the painful realization of loss before understanding and acceptance settle in. we remember the shedding of these tears always because they meant so much. in time though, we are grateful there was so much for us to mourn. Length of charcoal grey leather cord is 34’. the pewter medallion represents the fog of sorrow we feel during times of sadness. we are lost and without direction. brass is the metal of goodness. the large beads offer strength while the smaller ones provide the WISDOM needed to recover and find our way again. the mist will lift and hope will be known once more. Double strand. 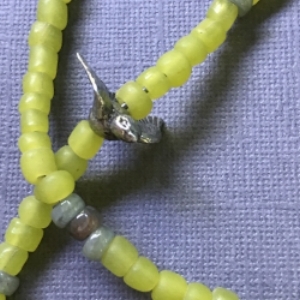 each strand can be worn SEPARATELY or as a set. Long strand measures 36’ and the choker strand is 20” in length. These are the sweetest tears of all as they contain memories of delight.. the soft hues of the strawberry quartz Tear reminds us of a kindness shared. length of cord is 18’. The black chain is grounding and suggests the strength that flows from understanding and acceptance . the ornate Silver represents memories that are sensitive, emotional and soothing while the single onyx bead holds them close to our heart. chain is 30” in length. .The lemon quartz crystals represent an uplifted spirit and a new-found brightness of the mind. The stones promote clear thought and help us find our way again. We are able to appreciate the abundance of good fortune we have known and feel gratitude for love we have shared. the rose-coloured tear represents APPRECIATION. it speaks to the gratitude we feel for having known and loved the one we did. we have recovered from their loss and now simply feel great gratutude for the good fortune they brought us. Chain length is 22”. .The faux leather cord is 20" in length. garnet is the stone of strong and INTENSE feelings. it supports deep love and great joy. such intensity of feeling requires protection and the strength of this piece will hold the most precious of emotions in safe keeping. the combination of garnet with the sensitive and purifying metal silver, speaks to the glory of all that is good. The length of the chain is 28” in length. The large sterling silver tear is reflective and mirrors the soul. it is the metal of emotions and it connects us to the flow of the universe. The carnelian tear supports the power of belief and offers the courage needed to BANISH indifference and live with purpose. The sterling silver snake chain is 18” in length. a single peach moonstone tear supports the heart and stimulates the mind to accept and overcome any burden. the chain of moonstones soothes worry and anxiety while it creates a sense of calm. Together, these gentle stones prevent over reaction and enhance the best in each of us. the necklace is 18" in length. TURQUOISE is the stone of truth and green turquoise represents balance and harmony. kearney’s tear, therefore, offers the honesty needed to accept all that has been lost while appreciating all that was loved. the smaller stones bring calm to a grateful heart while the natural goodness of brass holds hope for new love yet to come. if we could keep all we love with us always we would. sadly, time does not permit though so we treasure the memories instead. the turquoise tear is healing and it provides solace for the spirit during times of loss. it balances our emotions and allows us to find peace within our sorrow. the red coral beads transform our restless thoughts into peaceful memories while safeguarding us from depression. the single black bead, embedded AMONG the coral, pays tribute to the UNIQUENESS of MEMORIES that only we lived and now treasure, the grey leather cord is 24" in length. Two amber Tibetan Tears give meaning to a journey that led to healing. Pain happens in a moment but it can linger long afterwards. Time becomes heavy and days are interrupted with thoughts of sorrow. Strength and endurance allow us to see through the darkness and find the light of hope. The journey never completely ends but there are tassels of reward along the way. Silver Rope chain 20” in length. a triple strand of gold and peach stones. 28” in length. this ocean jasper tear offers a sense of calm and encourages deep and conscious BREATHS. it allows us to feel present in the moment and to lay our burdens down. the waves within the blue stone connect our thoughts and feelings and remind us that what we send out, will return so there are no endings. the worn blue stones hold memories once shared. the leather cord is 28” in length. the sterling silver PENDANT holds only the sweetest of memories. these are the recollections of happy times when love abounded and laughter rang out. times when long silences were spent in perfect comfort and all that was needed was the other beings presence. the garnet gemstone represents the worth of the relationship and the pureness of the bond shared. the length of the sterling silver chain is 22". The journey through sorrow must take its time and the distress can be great. so too is the belief that a new day will dawn, bringing with it acceptance and hope. the amber beads offer healing to those who wish to move forward and the supporting silver lends the strength to do so. The leather cord is 24” in length. life can seem like a maze of emotions at times. we can feel tangled and lost. brass is the metal of inner truth and courage and its natural goodness is to be trusted. this simple piece reminds us to believe in ourselves and to trust our instincts. a lesson well taught by dogs. Length is 22”. in every northern dog is the majesty of the beast. they have lived by their wits and survived THROUGH INSTINCT. the detail in the carving reflects the difficulties they faced while the plain braided cord speaks to the simplicity of their efforts. no matter, they remain true and honest dogs. they generously agree to share our lives and ask only to be respected for their loyalty. the leather cord is 28” in length. the northern dogs have all too often suffered harsh and troublesome beginnings yet they hold hope in their hearts no matter. their spirits are bright and hold the light of faith and goodwill. they are to be more than admired, they are to be bowed down to and praised. To be graced by a dog is to know glory and joy. the leather cord length is 26” in length. the delicate chain and tiny charms symbolizes the feelings of many rescue dogs. while being grateful for their own good fortune, they Never forget the dogs left behind . gratitude consists of both personal happiness and awareness for those who still await their opportunity. chain length is 22”. Brass encourages inner truth and offers the courage required to be honest and fair not only with ourselves, but with others as well. this piece eliminates false pride WHILE allowing for the time needed to heal and recover from sadness. leather cord is 28” in length. Brass signifies natural goodness and honesty. The coin pendant lends the courage needed to be brazen in the truth we speak and feel. A dog never lies and their souls contain a goodness we should all aspire to. There are certain feelings that belong just to us. They are not to expressed out loud or shared with another. Whether it be joy, pride, fear, regret or sorrow, the emotions are deeply precious so we mask them and keep them to ourselves. A dog, however, does not need to be told of our feelings. Words mean little to them. They respond to energy and trust what their senses inform them of. A dog sees beyond the mask and doesn’t believe our lies or excuses. They feel our fear, sorrow or joy without judgement or correction. They simply accept all we are and love us despite what they know to be true. And that is the glory of the dog. Still, the mask may protect us from people who wish to harm or betray. BRASS IS THE SYMBOL OF NATURAL GOODNESS AND HUMILITY SO IT IS MOST APPROPRIATE THAT IS REPRESENT THE NORTHERN DOG. THESE DOGS ARE TRUE AND HONEST AND THEY POSSESS THE PUREST OF HEARTS. THE SPIRIT OF A NORTHERN DOG IS FULL OF HOPE AND BRIGHTENS THE LIVES OF ALL WHO KNOW THEM. THE CHAIN IS 18" IN LENGTH. Northern dog #0051 b $20 Chain length is 28” in length. The “Love Like a Dog” bronze tags are made for Moosonee Puppy Rescue by an artisan in California. She supports rescue work and this is her contribution to saving the lives of dogs in need. The goodwill contained in each tag makes each piece even more special and we are grateful. Rescued dogs often suffer and are wounded somehow during their lives. Once rescued they love deeply and share their great gratitude. This purple jade pendant is for each one of these remarkable dogs. the bronze tag, coupled with a 28” bronze chain represents the solid, honest love of a dog. to love loyally and without distraction is the goal of all true relationships but only dogs seem to have perfected such devotion. Ordinary days go by and the steady rhythm of life can be hushed. then, a moment catches our attention and we smile, laugh or sigh deeply. A simple glance or gesture connects us to another and an understanding is shared. In these moments, we are grateful to love another who gives everything and means so much. These are life’s moments of Loud Joy. A simple, yet heartfelt promise – the pinky swear between friends – forget me not. Something kids understand from a very young age. Two charms on an 18” sterling silver chain. silver is the metal of the moon. Like the moon’s glow glistening on water, it is reflective and mirrors our best intentions. the crystal ball represents a promise made that is meant to be kept and the moonstone droplet lends BELIEF to the vow. the silver chain is 28” in length. the intricate design of the silver pendant speaks to the many attributes that contribute to true character. honesty, integrity, loyalty, devotion and more blend to create a backbone of strength that is worthy of respect and admiration. a dog’s character is not to be questioned and humans can only hope to possess such quality of being the yellow leather cord is 30” in length..
the sun shines on the darkest days when we have a dog to walk. antics and amusings on the other end of the leash create joy and enhance time spent together. length of yellow leather cord is 30”. huck was a dog of attitude and grand posture. he demanded respect from all other creatures as he was majestic in all things.. he felt it his duty to teach the rescue dogs their place so that they too would be able to hold rank in a human family. by respecting him, they came to respect themselves, or so he thought. he was a sensitive boy but showed it to only a few. huck had a life expectancy of just eighteen months due to a heart murmur he suffered as a pup but he lived for twelve years. he was too stubborn to do otherwise and he knew how much we needed him. huck was my hero and i adored him. inner joy is sincere, reserved and quiet. it does not require a fuss to be made or attention drawn to it for it is tranquil. it is personal and only we need to know what it is to celebrate a victory or accomplishment. inner joy is a feeling of blended confidence and goodwill that led to a deed of kindness or an act of shared affection. cotton cord length is 24”. it takes some people a while to understand and appreciate all a dog can offer. they cannot grasp just what a dog will mean to their lives. but once they adopt and share a relationship of adoration and loyalty, their souls are touched. a new sense of understanding is opened and the key to it is held dearly and close to their hearts under lock and key. chain length is 26”. when we wonder too long and doubt ourselves, we stand in our own way. opportunities are missed and possibilities are denied until we decide to risk just a little. what we discover outside our comfort zone can be brilliant and more than we thought for ourselves. this lightening bolt of awareness and realization shatters the dull and brings down the stars. When we are bent with laughter, filled with awe or graced with glory, we are experiencing Loud Joy. This collection is one of both appreciation and celebration. Each piece is a tribute to a relationship shared. silver is sensitive and emotional. it is soothing, calming and purifying.it signals a time of REFLECTION and illuminates the way forward. the touch of turquoise encourages calm and promotes inner harmony through understanding. turquoise leather cord is 20” in LENGTH. it takes some people a while to understand and appreciate all a dog can offer. they cannot grasp just what a dog will mean to their lives. but once they adopt and share a relationship of adoration and loyalty, their souls are touched. a new sense of understanding is opened and thIS GREY AGATE key to it is held dearly and close to their hearts forever afterward. chain is 22” in length. the square grey and ivory ceramic beads couple with tiny pewter tears to remind us of the sweet joy we felt when we first met another who understood and cared for us. we recognized in them a shared appreciation of friendship. the silver leather is 8 1/4 “ in length . the warmth of these greek ceramic beads promotes a sense of well-being. the earthy tones of terracotta encourages recovery from disappointment and the blue stone of lapis eases frustrations. freedom from worry and concern allows for a sense of contentment. length f leather cord is 26”. these vintage beads combine with small natural stones to create a sense of homebody comfort. for those who have a love that is as known to them as they are to themselves, and who simply need the presence of that other to feel content, this piece speaks to you. not all must glitter and sparkle as there is sensibility within the UNADORNED. beauty without glamour is to be appreciated. length of cotton cord is 30”. the soft hues of pink quartz bring us comfort as the stone of unconditional love opens our hearts to release memories with a gentle, graceful energy. we are reminded that cherished feelings are never lost or gone. the one large tear holds the greatest of emotions while the smaller tears represent the love that is still to come. the deeper pink aventurine stones promote hope and faith in tomorrow. necklace is 18” in length. There is no beginning or end to love. because it moves according to emotions and truth. the only direction is forward if love is to thrive and grow. the past holds love to be remembered while the future promises love once again or always. chain length is 22” in length. the midnight sun is rare and happens far beyond the north we know. just as the sun is seen through darkness, we travel from loss to love again. all is possible under the midnight sun. rosary chain is 34” in length. A single grey tear expresses the sweet joy known. when all we need is found in one other being the mother of pearl pendant expresses the age old desire to complete ourselves through shared love and the glittering starburst celebrates the accomplishment. length of chain is 30”. dogs are our companions and the connection we share with them is both unique and profound. words cannot express the bond that binds us but a large silver knot certainly can. there is no other relationship like it. the grey leather cord is 32" in length. Leather cord is 32” in length. the soft and gentle hue of the grey beads, coupled with the tiny pewter tears, speaks to the fondness we share with another. to be appreciated and valued by another is to know contentment and sweet joy. the silver leather is 7 1/2 “ in length..
the light may dim with loss but if the love was great, the sun still shines. the orange beads speak to the vibrancy of feeling that will never fade . even half a sun will light the way to brighter days. Length is 26”. The frailty of the carnelian chain speaks to personal vulnerabilities while the carnelian pendant lends courage to overcome self-doubt. The stones combined, encourage trust in ourselves and support good judgement. Carnelian is a stone of belief and it motivates us to become our best-selves. This piece celebrates self-worth. length is 32”. just a several sorts of beads make up this piece, so too do many breeds mix to create a mutt. it is the blending process that creates balance, beauty and interest so we are most fortunate to find it in the dogs and people we adore. Choker length is 20” and long string is 30”. can be worn together as shown or SEPARATELY. the soft hues of pink quartz bring us comfort as the stone of unconditional love opens our hearts to release memories with a gentle, graceful energy. we are reminded that cherished feelings are never lost or gone. the silver leather cord is 19” in length. the soft and gentle hues of the purple beads ebb and flow with just a slight variation of colour. the intensity of devotion varies as well. it can be loud and fierce when it involves the protection of a loved one or it can be silent and sensitive when a loved one is in need. whether it be demonstrated through a growl or a soft sigh and gentle nudge devotion is constant. length is 20”. it takes some people a while to understand and appreciate all a dog can offer. they cannot grasp just what a dog will mean to their lives. but once they adopt and share a relationship of adoration and loyalty, their souls are touched. a new sense of understanding is opened and the key to it is held dearly and close to their hearts under lock and key. chain length is 22”. dancing lights in the sky are the greatest celebration of life and love imaginable. the fine wooden pendant speaks to the worth of honest love and the spectacle of the sparkling light bolt suggests the value to be found in sharing love. length of chain is 25”. black chain is 30” in length. when love is true its direction is skyward. the mother of pearl pendant speaks to the worth of shared love and the tiny dog tag offers an identity and suggests the relationship is forever. chain length is 30” in length. a long time loss but not forgotten. the worth and meaning of the relationship was so great it lingers peacefully within the mind. the black wing, coupled with bronze beads signifies the endurance of the memory. Sadness and grief take due time to recover from. Once the heaviness of loss is replaced with acceptance and grace, however, we are able to appreciate the love we knew and give thanks for all we shared. the clouded blue pendant speaks to dark skies overhead and reminds us of walks in the rain and storms survived. brass is the symbol of natural goodness and humility so as the BIRD soars upward, our emotional cloud lifts and we realize we are still connected to all we knew, we become grateful. leather cord length is 30”. when thoughts are simply pleasant and memories cause a smile, send them to the one who made them so. sand end them on glittered wings of joy. wine coloured leather cord is 22" in length. often, grey days are days of thought. our minds wander and we take time to consider opinions, points of view and actions more carefully than ever before. and because no kind of weather prevents a walk with the dog, our musing time is enhanced by the company we keep. this piece honours those days. the grey leather cord is 30" in length. the waves within the ocean jasper pendant flow through our minds, hearts and spirits connecting our emotions. the blue bird gathers all we feel then soars afar, releasing memories into the universe to be shared. no distance is too great. turquoise leather cord is 28” in length. OUR THOUGHTS TRAVEL FAR WHEN LOVE MOTIVATES THEM AND THEY WILL FIND THEIR WAY TO WHERE THEY BELONG. WINGS ARE GIVEN TO MEMORIES ONCE SHARED AND STILL CHERISHED. the simplicity of the single green patina wing allows us to pause and causes us to recall a time of contentment that was well spent. length of turquoise leather cord is 20”. what better way to honour a dog we miss than by wearing a pledge to him or her. the words are literally heartfelt - “until the ocean covers every mountain high … I’ll be loving you”. suede cord is adjustable. wings and a tear #0118 $20 length of brass chain is 30”.